RIP Jake LaMotta "Raging Bull"
The boxing world lost one of our most iconic stars today, as the great Jake LaMotta passed away in Miami at age 95. Active as a pro from 1941 until 1954, he was one of the last remaining sports stars of the World War II era. He was also an unlikely candidate for such longevity. A relentless, pressure fighter, he absorbed tremendous punishment inside of the ring. He inflicted even more on himself outside of the it, through hard drinking and harder living. Then again, he was the man who remained standing until the bitter end against Sugar Ray Robinson during the “Valentine’s Day Massacre” in 1952. We should have known all along that he was never going to be an easy foe for Father Time to put away. LaMotta defeated such legends as Fritzie Zivic, Jackie Wilson, Lloyd Marshall, Holeman Williams, Tony Janiro and Tommy Yarosz. In June 1949, he defeated the greatest fighter in French history, Marcel Cerdan, to win the Middleweight Championship of the World. But LaMotta’s name will be forever linked to one other: Robinson’s. In the early 1940s, they were the two most avoided fighters in the sport. Nobody would let LaMotta near the middleweight belt and Robinson couldn’t get a shot at the welterweight crown. So the two faced off against each other, again and again. Between 1942 and 1945, they fought five times. Robinson is the greatest pound-for-pound boxer to ever live, but when he was at his best, nobody was a tougher opponent for him than LaMotta. LaMotta won just one of these fights, but the other four were very close, hard-fought battles and that lone win by LaMotta was the only loss Robinson took during the first 10 years and 130 fights of his career. Even in their final bout, the previously mentioned Valentine’s Day Massacre, which ended with LaMotta getting battered and stopped on his feet in Round 13, the two were nip and tuck during the first 12 rounds. LaMotta’s long life also gave him the room to rehabilitate his public image. He notoriously threw a fight against Billy Fox in 1947 and later admitted as much before a Congressional Committee. The event left him reviled for years, but it is important to understand the degree to which organized crime controlled boxing during the era–LaMotta’s decision to take a dive was an anguishing one, arrived at after years of being denied the spotlight he deserved. 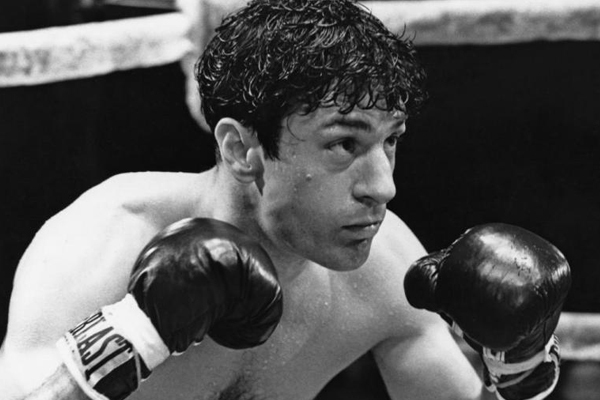 In 1980, Robert De Niro turned in what remains his greatest performance, portraying LaMotta in Martin Scorsese’s film adaptation of LaMotta’s autobiography. The film has made him one of boxing’s most famous legends. One of my favorite memories as a boxing fan is seeing LaMotta riding in the back of a convertible during the Hall-of-Fame Parade of Champions in Canastota, New York. At the time, he must have already been 90, but every fan watching on the sidewalk knew who he was and shouted their affection.